Conceive of how to place 450 products on a regular 40 X 48-inch pallet and design a skirt to hide the base made of stacked pallets. 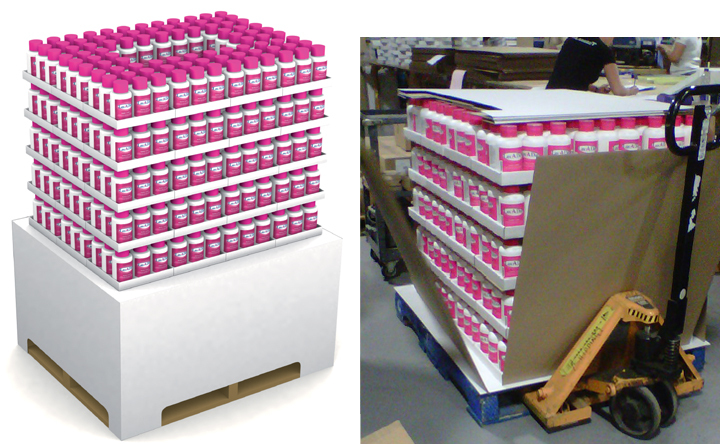 Complete assembly and co-packing of products required to be done prior to shipping. Design stackable trays holding 9 products with good label visibility and a skirt to be installed at store level to hide the base. A clean looking design with easy access to the products, clearly visibility of the logo on the bottle. The co-packing of the product was done by Promag.